Custom trophies will be awarded. Great payouts to each division. Cash to pros and over 1,000 discs to choose from for am payouts! 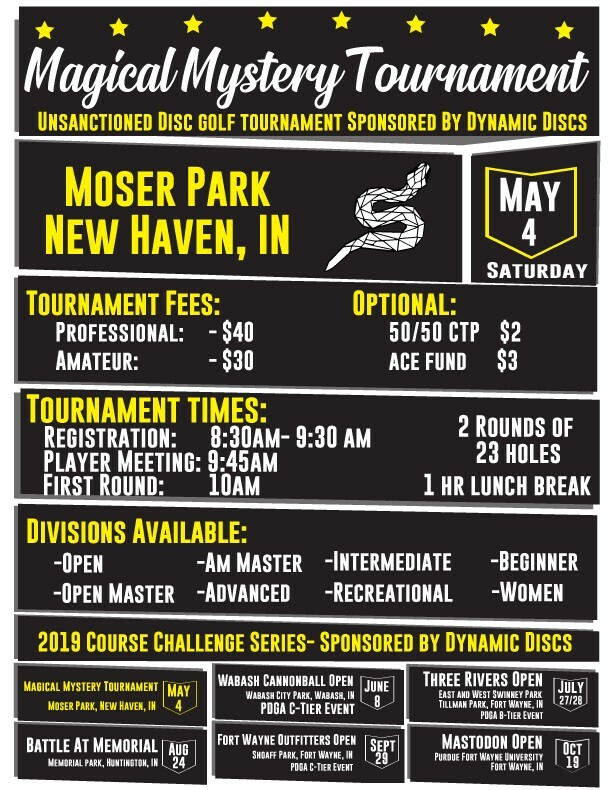 Magical Mystery Tournament is stop 1 of 6 of the 2019 Northeast Indiana Course Challenge Series! All tournaments consist of 2 rounds with approximately 1 hour for lunch in between rounds. Over $1,500 in end of series cash and prizes. Custom champion trophy to the winner of each division. Cash is awarded to pro and club merchandise voucher to amateurs. -The course challenge standings are based on a player's finishes in the course challenges throughout the calendar year. -Players that did not play in a particular course challenge are awarded points equal to the maximum turnout of players in their division plus one over all course challenges in a year. -The highest round of the year (out of the six course challenges) is dropped from the total points for every player. -The other course challenge points are tallied together to form a total score. 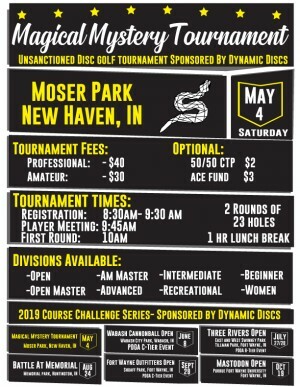 The player with the lowest total score is the course challenge series champion in that division. of 4 events. Must have 3 per division for 1st, 4 for 2nd, and 5 for 3rd. -Ties will be broken by most top finishes. Fort Disc Golf is responsible for all refunds/cancelations.